For vivid writing that's a breeze, try this promo gel pen with rubber grip and vibrant color barrel. For vivid writing that's a breeze, try this promo gel pen with rubber grip and many translucent and solid colors to choose from. Paper Mate Ink Joy Aluminum Promotional Pens combine the best feature of ballpoint and gel technologies into one great pen! This Paper Mate Ink Joy Gel RT Promotional Pen provides extra smooth writing with a vivid gel ink that dries 3 times faster than regular gel ink. It features a comfort grip that makes writing a breeze. The trendy design of this Paper Mate Element Ball Promotional Pen will set your company apart from the competition. 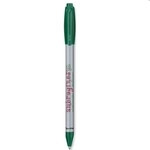 The Paper Mate Stick Imprinted Pen is one of the best selling promotional pens on the market. Add a new element to your promotions this year with this custom pen by Paper Mate. The silver barrel Paper Mate Sport Retractable Logo Pen is one of the best selling promotional pens on the market. Get great value for your promotional dollar with this sporty model. The yellow barrel Paper Mate Sport Retractable Logo Pen is one of the best selling promotional pens on the market. Get great value for your promotional dollar with this sporty model. The translucent barrel Paper Mate Sport Retractable Logo Pen is one of the best selling promotional pens on the market. Get great value for your promotional dollar with this sporty model. Step outside your element and help the environment with the imprinted pen by Paper Mate. The white barrel Paper Mate Sport Retractable Logo Pen is one of the best selling promotional pens on the market. Get great value for your promotional dollar with this sporty model. Your name will always be remembered with Paper-mate Promotional Pens, Logo Pens and Pencils from ePromos. These personalized promotional pens can be screen printed with your company name or logo. Promotional pens are a cost efficient yet effective way to get your name recognized, and are a useful gift so your business is sure to get the recognition you deserve. These Paper-mate Promotional Pens are great marketing giveaways or corporate gifts for any company. Brand name pens can be imprinted for your company or organization today. We make great pens that people love to hand out for advertising or gifts.